Turkey has announced that it will increase water supplies to Iraq to compensate for a drop in supply from Iran. According to Abu Dhabi-based The National, Iran has said it will cut water supplies to Iraq to prioritise projects within Iran. Turkey depends on water from the Tigris to fill a reservoir behind its new Ilısu dam. This summer, Iraq’s agriculture ministry banned the growing of water-intensive crops due to shortages. Posted in Agriculture, featured, Iran, Tigris, Turkey, water, water management. Turkey has reportedly postponed the filling of the Ilisu Dam on the Tigris river until July, as fears of major water shortages in Iraq increase. According to a report from The National, water levels of the Tigris have reduced significantly since last week, sparking renewed panic among Iraqis. The Turkish Ambassador to Iraq, Fatih Yildiz, told reporters that an agreement was signed last month between the two countries to regulate the flow of water. He added that dams built in neighbouring Iran on its tributaries of the Tigris have contributed to low water levels. Posted in Agriculture, Dams, featured, Iran, Tigris, Turkey, water management. Prime Minister Haider Al-Abadi chaired a meeting of the Ministerial Council for National Security (pictured) on Sunday, focusing on the water shortage in Iraq. The Council viewed a presentation by the Minister of Water Resources, Hassan Al Janabi, which included a plan to address the expected water scarcity for the current summer. The problem has been exacerbated by the filling of the Ilısu Dam in Turkey, and the recent irregular rainfall. According to a report from The National, water levels in Iraq’s main rivers have fallen by at least 40 percent in recent decades. Posted in Agriculture, featured, Irrigation, Tigris, Turkey, water, water management. On an unseasonably warm winter afternoon in Baghdad, Sheikh Anmar Ayid hitches up his robe and crouches by the Tigris river. Rocking back and forth on his haunches, he flicks the water from side to side – all the while chanting rhythmically in Aramaic. After finishing his ablutions, a two-minute procedure, the young sheikh turns to a small mud-brick temple and begins to pray. In past years, Ayid might then have quenched his thirst directly from the river. As a Mandaean priest, an adherent of a pre-Abrahamic faith that’s native to the Fertile Crescent, he and his co-religionists believe the Tigris – and the Euphrates – are sacred and flow from heaven. Clerics are consequently only supposed to drink from and eat food washed in their waters. That, however, is scarcely even possible these days. Dirtied and drained almost from the moment they rise, Iraq’s great waterways are in bleak states by the time they reach the country’s heavily urbanized centre. To drink straight from them is to invite near instant sickness. And so as the rivers plumb desperate new lows, seemingly worsening by the year, the Mandaeans are struggling to practice their several thousand-year-old rituals. Across the world, water pollution is leaving a devastating trail in its wake. Eighty per cent of all wastewater goes untreated, and much of finds its way back into rivers and lakes – where it contributes to ecosystem and public health crises. Up to a third of all rivers are blighted with pathogenic waste, according to UN Environment data, and a seventh suffer from organic waste problems, mostly from agricultural fertilizer run off. In largely desert countries, like Iraq, worsening sandstorms and diminishing grass cover have caked the rivers with dust and saddled water treatment facilities with a new range of woes. Never before, though, it seems, has poor water quality imperiled an entire religion. Already threatened by jihadists and criminal gangs, who damn them as heretics and target them for their historic role in the gold trade, the Mandaeans’ numbers have fallen from 100,000 to less than 10,000 in Iraq since 2003. For those who remain, pollution’s assault on one of the central tenets of their faith has added final insult to injury. In Amarah, 350 km south of Baghdad on the Tigris, the pollution is so debilitating that not even boiling water is enough to prevent local priests from falling ill. At their heavily-guarded riverside temple in the Iraqi capital, Ayid and his colleagues have taken to leaving buckets of water to sit for a day, before skimming off the layer of fetid scum that’s usually accumulated on the top. What makes this all the more frustrating for many Mandaeans is that the culprits are hiding in plain sight. With insufficient wastewater treatment facilities and lax environmental regulations, ever-growing volumes of industrial and domestic refuse are seeping into the rivers. In Baghdad alone, dozens of places, including the Dora oil refinery and the massive Medical City hospital complex, discharge waste directly into the Tigris, according to local conservationists. All this at the same time as upstream dam construction and reduced rainfall cut the rivers’ flow has brought the lifeblood of the Mandaeans faith to the brink of disaster. Globally, there is an increasing awareness that something drastic has to be done. UN Environment operates a monitoring system, GEMS/Water, which keeps tabs on river and lake water quality, and also helps states establish their own water quality surveillance networks. “For me, it’s like going to the doctor,” Bernhardt says. “You need that monitoring, those stats and numbers, to understand what’s happening and know a bit more about what you can do about it.” By encouraging the planting of water grasses and the preservation of wetlands, for example, UN Environment is pushing for green solutions to water quality problems. But for the Mandaeans, the fear is that no manner of solutions might arrive fast enough to save their rituals – and perhaps their very existence. Scattered now across Europe, North America and Australia, they question whether a community as small as theirs can endure in diaspora. That a people whose faith teaches care for the environment might die in part because of it is a tragic irony not lost on Sheikh Ayid. Learn more about UN Environment’s work on freshwater ecosystems. Posted in Agriculture, baghdad, featured, Irrigation, Tigris, water. Once it was the extremists who held Iraq’s water to ransom. Now it is tribes in Iraq’s southern provinces using water supplies as a deadly weapon. Last Sunday there was a heated debate in the Iraqi parliament. It was not about the extremist group known as the Islamic State, local militias, the US’ or Iran’s presence in Iraq, corruption or any of the other standard controversies that get MPs yelling at one another. Instead the debate was about water. The country’s minister for water resources, Hassan al-Janabi, warned that Iraq was about to face a water shortage and that the government urgently needed to make the topic one of foreign policy relevance as well as a domestic issue. An official report prepared by al-Janabi’s ministry was submitted to parliament and NIQASH was able to read it. It said that Iraq had lost around 30 percent of the water it used to get from the Tigris and Euphrates rivers, the two major waterways running through Iraq. Within just a few years, it will have lost 50 percent of its share of the rivers’ waters. And that is without taking into account the impact of climate change. The ministry of water resources said it would begin working on a long-term plan, working toward 2035, which would require an investment of US$184 billion. Of that, US$68 billion would be allocated to water for irrigation and used for agricultural purposes. 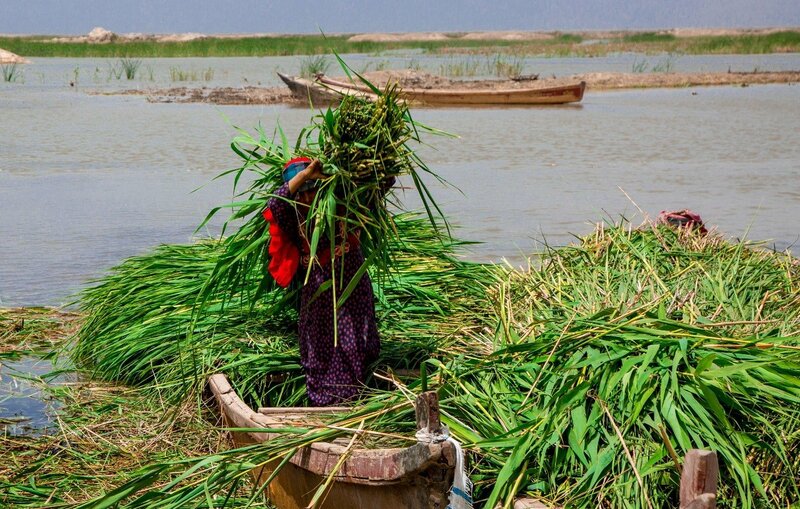 Over three-quarters of water in Iraq is used for agriculture, industry and for drinking. Iraq has always been proud of its two major rivers. And up until relatively recently the country had been spared the kinds of devastating droughts that have hurt countries elsewhere. Baghdad residents still remember the floods of the 1950s that used to hit the country every summer until a newly built suburban dam ended them. But the situation is very different today. A major part of the current problem lies outside the country’s borders. The sources of the Euphrates and the Tigris, as well as long stretches of the rivers, lie outside Iraq. Turkey, Syria and Iran control parts of the rivers and are already building, or have built, large dams to ensure that their countries have enough water in the future. Iraq, on the other hand, does not currently have the resources to start on such huge strategic projects. The Iraqi government’s abilities are limited to the maintenance of existing dams, mostly built during the Saddam Hussein regime. The most important of these are the Mosul and Haditha dams. Since an earthquake last year, the Dokan dam in northern Iraq has been out of service. Agriculture is being impacted already. “This year we lost about 30 percent of our wheat and barley crops because of water scarcity, drought and low rainfall,” says Mahdi al-Qaisi, the deputy minister for agriculture in Iraq. “That’s something we haven’t seen in decades and we have to reconsider how we irrigate in the country. We need to switch to crops that don’t require large quantities of water,” he argued. What is happening outside Iraq is now also happening inside the country, as provincial councils in southern Iraq fight to divert river water to their provinces or to somehow block the flow further down river. There are also fears that eventually the lack of water will lead to mass internal migration, as people living in drought-stricken areas rush to areas with more water. In fact, a few weeks ago there were physical confrontations between different tribes over water. “They would have become serious if it were not for the intervention of government authorities who promised they would try and solve the problem,” al-Hajami says. However, the farmers in Wasit say that it’s not their fault and that locals even further up river than them are the ones taking all the water which is why they, in turn, have to take more than they are supposed to from the Tigris river. “The people in Maysan accuse us of taking more than our share but in reality, we are not getting our full share because of a problem with the Tigris river and the low level of water coming in from Turkey,” suggests Abbas al-Maksousi, one of the tribal leaders there. The same sorts of problems are coming up in the provinces of Dhi Qar and Muthanna too, where fighting erupted between tribes last month because of anxiety over water from the Euphrates. In the provinces, al-Tamimi thinks the ministries of the interior and water resources need to work together to prevent those abuses. “Or we will see more dangerous conflicts in the future,’ he suggests. Al-Tamimi also believes that Iraq’s water should become a part of other ministerial portfolios because it overlaps the trade, energy, oil and foreign policy sectors. In particular, he believes there is special urgency for the ministry of foreign affairs to get involved. Posted in Abbas, Agriculture, baghdad, Business, Committee, Corruption, featured, Irrigation, Syria, Tigris, Turkey, water. An Iraqi government delegation is planning to visit Turkey to discuss environmental concerns over Turkey’s Ilisu Dam on the Tigris River. The amount of water in key Iraqi rivers has reportedly fallen by at least 40 percent in recent decades due to erratic rainfall, and the construction of dams in neighbouring countries. Posted in Agriculture, featured, Irrigation, Politics, Tigris, Turkey, water, water management.